Tehran, 27 March 2006 (CHN) -- The ancient festival of Norouz in Pakistan is celebrated as the symbol of New Day. Norouz in Pakistan is called Alam Afrouz meaning the New Day that illuminates the world with its arrival. This day begins in March and traditionally represents the rebirth of nature after the long winter. The New Year begins the instant the son is no longer in the astrological sign of Pisces and enters Aries. It is celebrated as a time of renewal. Norouz has an exclusive importance among the people of Pakistan and therefore different social and religious groups elucidate in details about it in the calendars they publish. The calendar is called Jandri. One of the customs of Norouz in Pakistan is the practice of burning piles of wood. The bonfires are a symbol to destroy any remaining evil from the previous year. Season cleaning, putting on new clothes, preparing certain sweets such as "Luddoo", "Golab Jamen", "Rus Malai", "Barfi", "Shekar Pareh", "Cream Roll", "Souhan Halva", and giving and receiving gifts (Eidi) are among the ceremonies practiced in Pakistan. 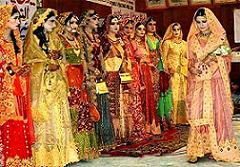 In sime cities, women take part in a bridal dress show to celebrate the New Year. During Norouz, people avoid unfavorable talks and follow a kind attitude toward each other. Composing and reciting poems in Urdu, Dari, and Arabic are quite trendy as well. The Pakistani people believe that hope, peace, and amity in the Islamic world are the purposes of Norouz. They believe that this way, freedom, fortune, happiness, fraternity and equity would rest in the souls and hearts of the people.